How long do you think all the Halloween candy will last? Between the leftovers and what the kids might bring in, you could have sweets until Thanksgiving. What about all the Halloween decorations? How long will they be kept up? Unlike Christmas, Halloween decorations don’t fare well the day after. Time to pack them up. It might also be time to get rid of the rest of your scary junk. This would be all the rubbish that is crammed into your garage, closets and spare room. Why not treat yourself to a session with Junk King Los Angeles today? You’ll be amazed at how one session can transform your home. The amount of unwanted clutter we accumulate is directly related to the amount of free time we have. After all, if our weekends were open, then maybe we could rent our own truck, load everything up and drive an hour to get to the proper disposal center. The alternative is letting Junk King come over for a few minutes and clear everything away. It might still take them a few hours to properly dispose of things but that isn’t anything you have to worry about. When the crew pulls away from your home, the job is done on your end. You can then plan all things you’re going to do with the reclaimed space. Along with all the clutter Junk King Los Angeles can take from the inside of your home, they can also work wonders with the outside. This might be a good idea especially if you have some leftover debris from your Halloween decorations. Everything can go on the back of the truck. Junk King doesn’t charge one price for furniture and another price for boxes. The price is always about how your stuff will fit onto the back of the truck. The Junk King crew will know this after looking over all the things you want to get rid of. This is what they’re trained for. Once that estimate is locked down, they’ll spring into action and your clutter will vanish. Don’t let your junk scare you. Give it all to Junk King Los Angeles today. 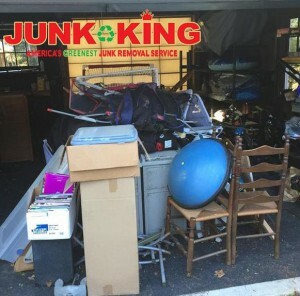 This entry was posted in LA Junk Removal and tagged junk, junk king, junk removal on October 31, 2017 by Junk King. Last updated November 1, 2017 .